[INDEPENDENCE, IOWA] – Friends of Cedar Rock received the Governor’s Volunteer Award from Governor Kim Reynolds and Lt. 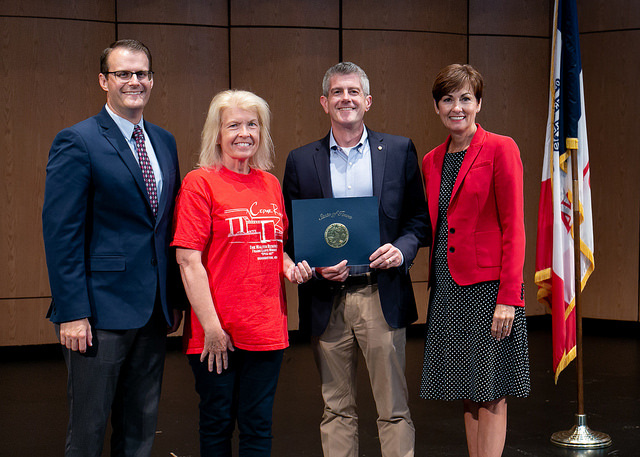 Governor Adam Gregg during a special recognition ceremony held July 30, 2018 in Marion, Iowa. The Friends of Cedar Rock was selected for a group award by the Iowa Department of Natural Resources State Parks Bureau for restoring the last remaining original Frank Lloyd Wright river pavilion. The friends group raised nearly $200,000 for the project. Photo: Lt. Gov Adam Gregg, FCR Secretary Patty Reisinger, FCR Vice President Matt Daughenbaugh receive their Governor's Volunteer Award from Gov. Kim Reynolds for their work and dedication at Cedar Rock State Park on their Restore the River Pavilion Project.